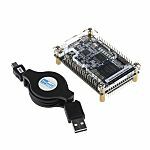 These development kits are to be used with programmable logic technology, they are easy to use and efficient ways of programming your logic devices, whether they are FPGA technology, CPLD or an ARM Processor. Programmable logic development kits can also be called "trainer board" or "starter kits". These development kits come with all the generic adapters, most often via USB cables, needed to easily program your devices. USB Programmers - These USB programmers generally run a USB from your computer to a small board that allows you to efficiently program various chips. Flying Leads - Adaptor that allows you to use flying wires to connect to distributed terminals on PCB's and from there program your devices. Module boards - Add-on boards to provide additional benefits such as hi-speed USB transfers or use with breadboards. Development kits, starter kits and modules are available from a range of brands such as, Altera, Lattice Semiconductor Terasic, Xilnx, Trenz Electronc GmbH and more.